SALVADOR – Coconut milk and heady spices dancing on the pallet bring to mind India, Africa or the Caribbean but these flavors are also the hallmarks of Bahian cuisine. The state located in the Northeast of Brazil with Salvador as its capital has long been famed for its stunning landscape, beaches, music and colonial architecture. However it also has a lot to boast about when it comes to cuisine, and does so in the Museu da Gastronomia Baiana (Bahian Gastronomic Museum). 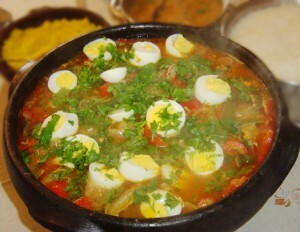 Bahia's famous Moqueca dish, photo by Janaina Roberge/Wikimedia Creative Commons License. It may be small, but the museum amply introduces the visitor to some of the basic principles of the local cuisine, and most importantly that Bahia has three main influences in its cooking; ‘Da Terra’, ‘Da Costa’, and ‘Do Reino’. Da Terra (‘of the earth’) flavors come from the native populations of Brazil before it was colonized by Europeans. Da Costa (‘of the coast’) flavors, meanwhile, come from the African coast. Bahia, which has the highest black and mulatto population in Brazil, has been highly influenced by Africa in every aspect of its culture and cuisine is no exception. Finally, Do Reino (‘of the empire’) are the flavors brought over from Portugal which had in turn been imported from far off places such as India and China. This triumvirate of influences has helped create the unique tastes enjoyed in the state today. Inside the Museu da Gastronomia Baiana, phot by Alexandra Alden. Dendê oil made from African palms remains one of the principal ingredients in Bahian cuisine and homage is paid to it in quotes from famous songs and poems whose lyrics line the walls of the museum. This intensely flavored oil which can floor the weak of stomach is a prime example of the close cultural link between Bahia and Africa. The oil was originally made in Angola and Gambia before being shipped over to these shores. The museum also houses traditional water carrying devices, from hollowed out gourds to intricately designed ceramic affairs. The size and purpose of each object being well detailed in nearby descriptions. The final and possibly most important part of the museum is the collection of recipe books laid out for visitors to look at (and copy down the contents), all of which are skilfully deployed at the upstairs SENAC restaurant. There are varied recipes for moqueca, a type of stew made with coconut milk, dendê oil, onions, coriander, limes and traditionally shrimp or seafood (but can also be done with beef or chicken) and the famous Aracajé are also present. These black eyed pea fritters filled with shrimp and topped with pimenta malagueta (chilli) sauce are sold in street food stalls across the city and are a staple Bahian snack food. The recipes are a little gift that the visitor can try at home. The museum, housed in a 19th century colonial townhouse, is located in Praça José de Alencar in the Largo de Pelourinho of Salvador. It is actually run by SENAC, a celebrated cultural institute, and includes the restaurant and book/sweets shop that sells SENAC publications as well as Bahian pastries. A must-see for any foodies who find themselves in Salvador and develop a taste for some of the country’s best food. Praça José de Alencar, 13/19 – Largo do Pelourinho. Open Monday to Saturday from 9AM to 11AM and from 12PM to 5:20 PM.